Low. Long. Sleek. With a growling exhaust note and a searing red paint job that could have come from a concept car. Fast. Agile. Daring. The luxury-sport coupe category is about to get a lot hotter. 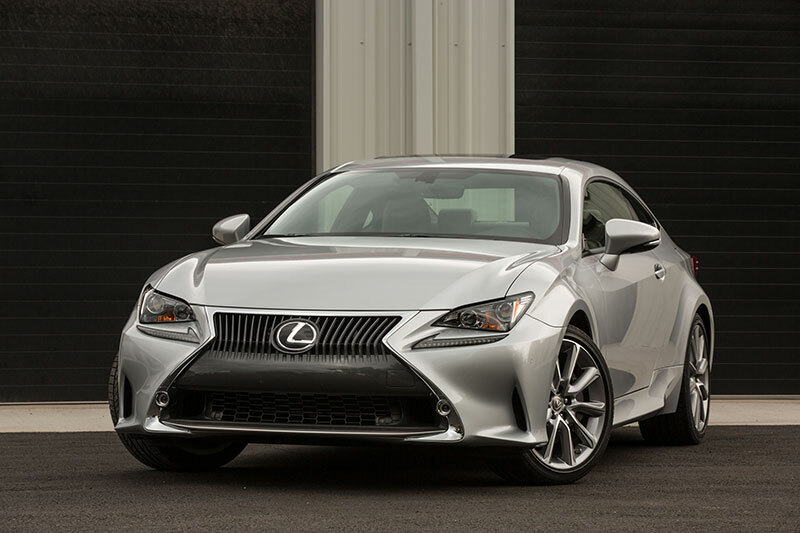 The 2015 Lexus RC 350 arrives this fall, melding audacious design and high performance like no Lexus before. Engineered as a stand-alone model, rather than as a two-door derivative of a sedan, the RC delivers all the performance, individuality, and unique luxury and technology that its body promises. Lexus expects the RC to attract the next generation of luxury buyers and those new to the brand. 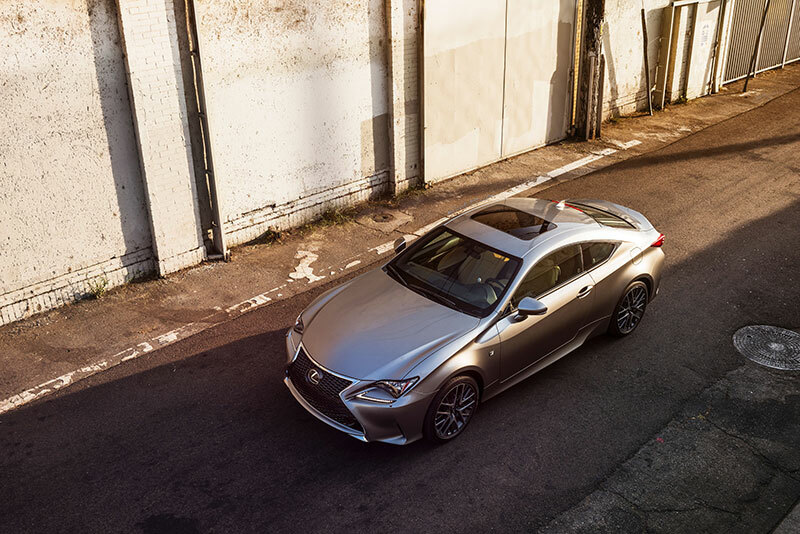 While the RC 350 swaggers with a striking exterior, it features efficiency under the hood. A standard 306 horsepower 3.5-liter V6 teamed to an eight-speed Sports Program Direct Shift (SPDS) transmission for rear-wheel drive models helps provide smooth acceleration, predictable torque and good fuel economy. A key to the RC’s exceptional handling ability is a new ultra-stiff platform. The RC is the latest model from a ride and handling transformation at Lexus that started with the current GS midsize luxury sedan and progressed with the new-generation IS sport sedan. Following the stunning, limited-production LFA supercar, those latest Lexus models and the new RC are taking the brand in a more emotional design/performance direction. From launch, Lexus will offer the new RC 350 in both rear-wheel drive and with all-weather drive, the latter using a six-speed automatic transmission, and an F SPORT version. Distinguished by exclusive exterior design and interior features, the F SPORT will also raise the performance ante with standard Adaptive Variable Suspension (AVS) system and the available Lexus Dynamic Handling system, which includes rear-wheel steering. The driving environment is no less exciting than the dramatic body enveloping it. Infused with a strong sports car aesthetic and pure Lexus luxury, the RC cabin also reflects a strong influence from the Lexus LFA supercar. Beneath its alluring lines, the RC introduces several Lexus firsts in technology and production engineering developments. For example, the signature paint color, Infrared, introduces a new paint technique that was pioneered on concept vehicles. Called contrast layering, it is a Lexus first for mass production. The Lexus RC’s chassis is unique, although it does draw from the architecture of other Lexus vehicles. The front end is based on the highly acclaimed Lexus GS, which set new standards for stiffness and chassis response in a mid-sized sedan. The rear of the RC platform is based on the new-generation IS sport sedan, a car that has already proven its performance and handling mettle in a hotly contested segment. In the center, where the structure needed to maintain rigidity with two large door openings, Lexus borrowed from the IS convertible structure. None of those three portions was directly taken from the other cars. Rather, each contributed more than the sum of its parts to the overall chassis package. 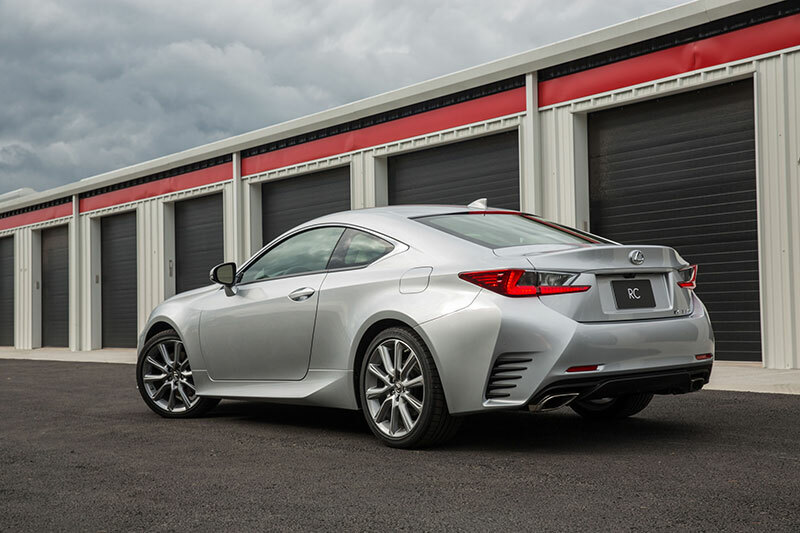 Lexus fine-tuned the resulting platform to provide the specific high-performance character sought for its new coupe. To create the best-handling regular production Lexus yet, Lexus started with the handling stars of its current line, adapting portions of their platforms to create an exceptionally rigid foundation for the RC. The front suspension area is based on GS, with increased apron panel thickness. The center floor section, based on the Lexus IS C, has an enlarged rocker cross section – nearly double that of IS sedan — to help provide exceptional control. The rear floor is based on the new-generation IS sport sedan, with added center-floor reinforcements. As it did with the IS, Lexus applied new manufacturing techniques to yield a rigid body structure. Laser screw welding, additional spot welding and special body adhesives all do their part to help give the RC a strong body. High-rigidity structural adhesive is used to help secure the windshield and backlight. Under-floor braces added to the radiator support and number-two crossmember, along with a front A-brace, tunnel brace and trapezoidal rear brace, all help contribute to rigidity. The driver will feel the net result of all those construction features when aiming the RC into a corner and then feeling its impeccable blend of crisp turn-in response and utter poise through the curve. And if there happens to be a small bump in the curve, all the better to show off how the RC’s stiff platform and finely tuned suspension work together to help the driver keep the car composed. Lexus chose a naturally aspirated V6 for its instantaneous response and performance-driving character. It also sounds like a proper GT car, with a distinct but refined growl under acceleration and a pleasingly present but quiet demeanor when cruising. An intake sound generator further enhances sonic appeal under acceleration. The overall effect is memorable, but never abrasive, and doesn’t intrude on conversation or music enjoyment. 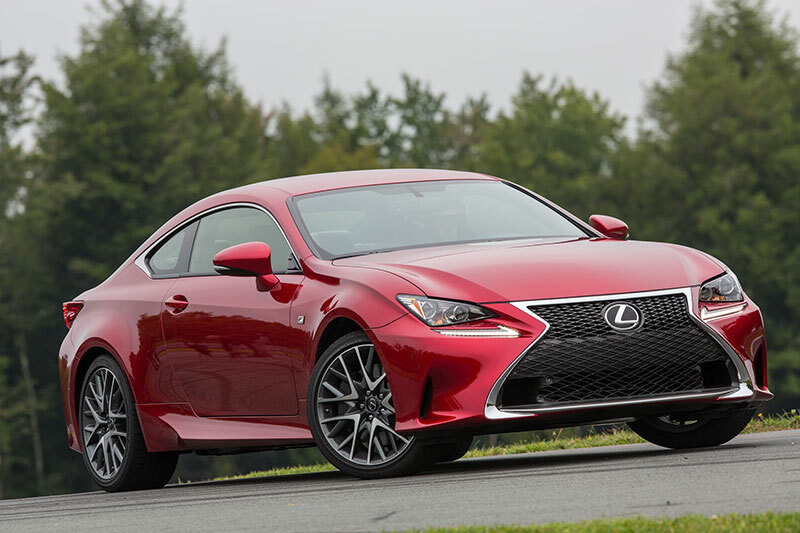 The 3.5-liter Lexus 2GR-FSE V6 propels the 2015 RC 350 with 306 horsepower and 277 lb.-ft. of torque. An aluminum block and heads keep weight in check. Key technologies that get credit for the broad torque curve and quick response include intelligent dual variable valve timing (VVT-i) and the Lexus D-4S system of direct and port fuel injection. With one injector installed in the combustion chamber and a second mounted in the intake port, D-4S combines the strengths of both for maximum efficiency and low emissions. Eight is enough. That’s certainly true of transmissions for high-performance cars. But what’s the best way to control the gears for the ideal performance experience? The 2015 Lexus RC 350 answers with one of the most acclaimed transmissions in use today, the eight-speed Sports Program Direct Shift (SPDS) transmission. This transmission debuted in the esteemed IS F high-performance sedan. The SPDS transmission combines the best of both worlds: torque converter smoothness with shifting speed of a dual-clutch unit when shifting manually. A long-travel damper for the lock-up torque converter boosts fuel economy and ensures smooth, quiet lock-up. The SPDS transmission has three driver-selectable modes – NORMAL, SPORT and MANUAL (M), which have full torque-converter lock-up from second to eighth gears for “clutchless” manual shifting. Downshifts are made in just 0.10-second in M mode, with the transmission’s throttle blipping control matching the engine speed to the gear. The transmission’s shift control has been further developed to respond precisely to slight changes in accelerator-pedal operation for an even more dynamic and inspiring driving feel. The eight ratios have been chosen to balance the needs of performance driving and fuel efficiency. Compared to the Lexus six-speed automatic transmission, first gear is 8.5 percent shorter and top gear is 2.9 percent taller. The transmission SPORT mode includes G-sensor AI-Shift control, which uses information from the G-sensor on driving status to provide the optimal gear ratio for sporty driving. In SPORT mode, the transmission offers more dynamic acceleration control for a more sporting driving experience. The transmission will automatically downshift during hard braking for a corner, hold a lower gear through the corner for greater control, and then give the driver a greater power response on corner exit by selecting a suitable low gear. NORMAL mode provides fuel economy and seamless acceleration traditionally associated with Lexus electronically controlled transmissions. It uses all eight gears for optimum fuel economy, while coordinating control with the throttle to provide smooth acceleration and minimal feeling of gear changes. The Lexus RC listens to the driver through the Drive Mode Select system. Using a dial on the console, the driver can literally “dial in” the performance response and feel desired from the car. Drive Mode Select tailors the vehicle’s powertrain, electric power-assisted steering assist curve, air conditioning and, on F SPORT, suspension response. Modes include NORMAL, SPORT S and ECO in the RC 350. The F SPORT adds SPORT S+ mode for maximum handling performance from AVS suspension and the available Dynamic Handling System. The RC likewise draws its suspension design, though not the individual parts, from the GS architecture. The front suspension is double wishbone, and the rear suspension is multi-link with a toe control arm. Monotube dampers offer ideal damping and control for a high-performance car. Because the RC is much stiffer than the vehicles that have contributed platform technology, Lexus was able to employ much higher damping forces and use larger diameter stabilizer bars front and rear, all without adversely affecting ride comfort. Most of the suspension components are new. At the front, the RC gets a new suspension upper support, coil spring, damper, stabilizer bar, stabilizer bar bushing and lower number two bushing. The rear coil springs, dampers, stabilizer bar, and stabilizer bushings all are new for the RC. RC 350 F SPORT takes handling acumen to a higher level with Adaptive Variable Suspension (AVS) system and the Lexus Dynamic Handling system with Dynamic Rear Wheel Steering. Driving connoisseurs well know that maximum agility demands rear-wheel drive (RWD), or an all-wheel drive system (AWD) that’s biased for rear-wheel handling characteristics. The Lexus RC 350, in RWD or AWD form, delivers on that promise. RC 350 chassis engineers aimed for exceptional steering response and smooth roll transfer during initial turn-in; minimal roll and rapid yaw-rate gain for agile turning mid-corner, and smooth steering feel with smooth body movement from corner to corner. The Lexus RC’s aerodynamic performance leverages the flow of air over and under the car to help optimize controllability, especially when traveling at high speeds. Aerodynamic handling stability features begin of course with the overall body shape that minimizes drag, for enhanced fuel efficiency and reduced noise. The rear quarter panels are designed to smooth the airflow around the vehicle. Aero-stabilizing fins and a flat under-body design are among the myriad details that ensure the RC slips through the air as efficiently as possible. The aero fins are strategically placed in key areas of the underbody, and there is also an aero-stabilizing guide behind the front bumper to suppress vortex formation and increase radiator efficiency. Stabilizing fins are also fitted to the tip of the doorframe molding and the rear lights. Ducts in the front bumper enhance aerodynamic and brake-cooling performance. Even the shark-fin style radio antenna plays a role in aerodynamic performance while also delivering high reception sensitivity. The sharp cutoff at the trunk edge helps to smooth airflow from the roof. Rear under-floor aero devices to help create negative lift, and the angle of the rear under cover has been raised, for optimum aerodynamic effect. No surface went unconsidered. Front and rear wheel spats reduce airflow hitting the tires. Front fender liners have an aero-groove shape to help direct airflow along the tires, in the same direction as the wheel rotation. The rear fender liners have a bead to direct tire-generated airflow to the outside of the vehicle. Door parting line gaps were reduced to 3.8 mm to both enhance appearance and reduce wind noise. Finally, the roof panel is brazed directly to the side members, eliminating the need for a roof drip molding. The electric power steering (EPS) provides a natural, form feel with good feedback thanks to rigid mounting hardware. A new, high-rigidity gear-mounting bushing for the steering rack is one of the numerous details that contribute to the RC’s sports car-like steering. Exclusively for RC 350 F SPORT, the available Variable Gear Ratio Steering (VGRS) automatically changes the steering gear ratio in response to vehicle speed and driving conditions. To reduce the steering angle when turning the steering wheel at extremely low speeds or when performing a U-turn, VGRS decreases the number of turns of lock to lock. In urban areas, on mountain roads, and other situations when the steering wheel is frequently operated at low to mid speeds, an optimum ratio is selected to provide light, easy-to-handle vehicle responsiveness. Lexus engineered the 2015 RC 350 F SPORT for drivers who view “Curves Ahead” road signs as invitations rather than warnings. A combination of Adaptive Variable Suspension (AVS) and the Lexus Dynamic Handling (LDH) with rear-wheel steering technologies turn the RC 350 F SPORT RWD into a road warrior with a refined attitude. The LDH system, available for F SPORT RWD only, is designed to help enhance maneuverability and reduce steering effort at low speed; help increase steering responsiveness and intuitive steering feel at medium speeds; and help enhance control at high speeds. It does so by integrating electric power-assisted steering (EPS) to control steering torque, variable gear-ratio steering (VGRS) to control front-wheel steering angle and Dynamic Rear-wheel Steering system (DRS) to provide the benefits of four-wheel steering while maintaining the feeling of a conventional two-wheel steer vehicle. LDH is designed to provide the ideal wheel front and rear wheel steering angles to help with optimum response and safety at most vehicle speeds and in most driving conditions. At speeds up to approximately 50 mph, the system slightly turns the rear wheels the opposite direction as the front wheels to help tighten the turning radius and enhance cornering performance. Above approximately 50 mph, the front and rear wheels turn in the same direction, for enhanced high-speed control and a more natural-feeling vehicle posture through high-speed corners. DRS is integrated with the RC 350 F SPORT Drive Mode Select SPORT S+ mode, which changes the DRS characteristics to enrich steering response and the performance-driving feeling. In addition, the system interacts with Vehicle Dynamics Integrated Management (VDIM) and the Pre-Collision System (PCS) to help avoid or rectify vehicle instability in an emergency situation by optimizing front and rear wheel angles. Adaptive Variable Suspension (AVS) is a variable damper system designed to enhance ride comfort and body lean control, contributing to natural, smooth changes in vehicle attitude. The AVS system on the RC 350 F SPORT, monitors steering input and road conditions and adjusts the dampers to suit, using inputs on vehicle posture including lean, dive and squat. The system continually optimizes roll attitude and rebound control to help achieve a flatter ride and more natural vehicle posture. When the driver selects the SPORT S+ setting in Drive Mode Select, AVS switches to maximize the damping force for ultimate handling response. When driving on a rough road surface, AVS switches to a lower damping force (oil moves through the dampers quickly) to help absorb vibrations for a smoother ride. When the RC pitches forward or back (during heavy braking or hard acceleration), damping force is increased (less oil is allowed to move through the damper) for ideal vehicle composure. These motions are detected from the brake/accelerator pedal, not just from vehicle angle sensors, to ensure early AVS reaction. During cornering, damping force is increased to help ensure handling and reduced body lean through the corner as well as to provide a more comfortable ride. Lexus AVS can also interact with the VDIM system and PCS to optimize damper rates in response to potentially hazardous situations. For example, the AVS applies increased front damper force as an anti-dive measure during emergency braking. Accentuating the vibrant paint colors, the Lexus RC debuts new 18- and 19-inch alloy wheels, each featuring machined spokes. The 18-inch wheel and available 19-inch wheel uses a five-spoke design. The 19-inch F SPORT wheel has a distinctive 10 twin-spoke layout to create a deeply sculptured shape. The bright machined finish of the 18-inch wheel widens towards the rim. On the 19-inch F SPORT wheel, a bright machined finish is applied to the silhouette of each of the 10 individual spokes, adding a touch of elegance. With either wheel, the RC uses a staggered array, with wider wheels at the rear to emphasize the car’s wide stance. The available electronically controlled all-weather drive (AWD-i) system uses an electronically controlled center differential to vary the torque split from 20:80 to as much as 50:50 to help enhance traction and grip under a wide range of driving conditions. The system retains a rear-wheel bias in most driving to give the AWD model a rear-drive feel and agility. The RC 350 RWD and AWD variants have 13.15-inch diameter brake rotors front and rear. Commensurate with its higher-performance mission, RC 350 F SPORT gets its own 14.06-inch diameter two-piece rotors and high-friction brake pads. The rear brake calipers are lightweight aluminum alloy. Braking feel is as important as effectiveness in a performance-tuned car. A new two-stage brake booster ensures optimum braking effectiveness and controllability: the pedal-force versus deceleration curve is linear in the first stage to help with controllability and provides enhanced effectiveness as pedal force increases. Cold-forged brake pedal bracket mounting collars optimize pedal rigidity, and a shortened pedal stroke-to-brake take-up point enhances controllability. Lexus RC’s frontal and side collision protection measures include the use of hot-stamped steel sheet of up to 213,205 psi tensile strength in key areas of the body; part of the RC body is 43 percent high-tensile strength steel. Lexus RC has eight SRS airbags, including a dual-stage driver’s airbag, dual-stage and dual-chamber front passenger airbag, driver’s and passenger’s knee airbags, front-seat side airbags and first and second row side curtain airbags. All RC 350 models have Vehicle Dynamic Integrated Management (VDIM), the Lexus system that coordinates control of the powertrain, ABS, electric power steering, traction control (TRAC) and Vehicle Stability Control (VSC) systems. Lexus VDIM can anticipate loss of traction and help ensure the traditionally separate active safety systems of VSC, TRAC, and ABS work in concert to help correct it by seamlessly integrating control of basic ‘drive-turn-stop’ vehicle performance. VDIM functions also include Hill-start Assist Control (HAC). The new RC 350 F SPORT RWD features the latest iteration VDIM, which adds control of Variable Gear Ratio Steering (VGRS), rear-wheel steering and the Lexus Dynamic Handling system, for integrated lateral force and yaw moment control. The Lexus RC offers the added peace of mind of available Pre-Collision Brake and Pre-Collision Brake Assist systems. Using the radar sensors of the Adaptive Cruise Control, these systems are designed to detect the potential for a collision between the RC and an obstacle or vehicle ahead. Both systems can operate brake control to reduce the impact. Pre-Collision Brake and Pre-Collision Brake Assist help increase the driver’s braking effort. The Lexus design brief for the RC could be described as “coolness over utility.” That simply means there would be no compromising the design. The RC is a pure 2+2 coupe, with the comfort priority placed on the first “2” in that equation. There’s enough room in back for friends to ride along, though, and there are unique features to make getting into and out of the rear seats easier. But the RC was designed first and foremost to please the driver and a lucky front passenger. From every angle, the low profile, wide-stance RC with its short wheelbase and large diameter wheels is intended to provide a visual jolt. The Lexus signature spindle grille, a focal point of the design, is the lowest and widest application yet of this brand signature design element. The F SPORT takes the spindle grille design further. The mesh pattern of the upper section gradually transforms into an “F” character as it approaches the lower extremity. “To make the exterior immediately recognizable, we adopted a design with a compact cabin contrasted by boldly protruding fender flares and body contours etched with deeply sweeping lines,” said Eiichi Kusama, RC 350 Chief Engineer. That design, however, challenged conventional production methods. It also inspired solutions. Lexus crafted a unique new platform for the RC, borrowing only select parts from the IS and GS models. The RC 350 rides on a 107.5-inch wheelbaseis 184.8 inches long and stands 54.9 inches tall. The new coupe measures 72.4 inches wide to the edges of its fender flares, a deliberate design theme to envelop wide wheels and tires and to give the coupe a particularly grounded look. The RC rolls with 18-inch or 19-inch alloy wheels, depending on specification. In daylight or night, the 2015 Lexus RC announces its presence with Lexus signature headlamp design and technology. State-of-the-art -LED headlamps and separate L-themed daytime running lamps (DRLs) ensure both a unique look and highly effective illumination. Separating the DRLs also reduces the visual weight of having all lighting elements condensed into single, large units. Placing the headlamps at a higher position than the grille creates a powerful and daunting expression of eyes staring ahead. Given its performance capability, the RC will most often be seen from the rear. Lexus wanted it to leave a distinct impression at it passed. A combination of multiple LED lamps and cutting-edge lens technology give the rear lights a sparkling effect reminiscent of glittering gems. Like the headlamps, the rear combination lamps show the distinct Lexus L-shape motif. But, rather than simply embed the motif as a graphic element within the lamp unit, the surface is raised to create a three-dimensional “L” effect. A clever lens design gives the sparkling effect of 50 LEDs per side but uses 24 per side. There are two inner lenses, a stepped inner lens and an outer lens with a series of multi-layered serrations on its surface, three for each LED bulb. Aligning the serrated sections to achieve the desired sparkle effect required painstaking effort, precise calculations and studying many illumination examples. Lexus designers feel the effort was well worth it. Lexus pioneered new techniques in paint quality, and with the RC the brand begins a new phase of vehicle painting technology. Lexus developed seven exterior colors for RC and another three for F SPORT models. A new five-layer paint process used for the first time in true mass production is at the heart of new brilliant colors for the Lexus RC. The extraordinarily complex multi-layered, twice-baked process has been used before – but usually only on concept vehicles or for custom cars. Fitting for a high-performance coupe with a bit of a mean streak, the technique sprang from America’s hot rod culture. And also quite appropriate for a car throwing such performance heat, Lexus chose a new color, Infrared, as the signature color for the RC. To create the blazing new red, the first coat is a primer, followed by silver, a clear coat, then a deep metallic red that reflects off the silver to give an additional luster. A final top coat is then applied. The vehicle passes through baking ovens twice during the process, and will be sanded twice by hand with a gentle water-based application. Inspectors scrutinize each vehicle to ensure the paint meets strict standards. The six RC colors include Infrared, Starfire Pearl, Nebula Gray Pearl, Silver Lining Metallic, Atomic Silver, and Obsidian. The F SPORT offers three exclusive colors: Ultra White, the all-new Ultrasonic Blue Mica 2.0, and an all-new orange, Molten Pearl. Molten Pearl uses a four-layer process made possible by the strength of its primer material and vibrant primary color, meaning a silver reflective coat is not necessary. Ultrasonic Blue Mica 2.0 uses the same five-layer technique as Infrared. Lexus long ago set the benchmark for a new industry standard in tight and consistent panel gaps, . For the RC, Lexus once again raised its own game, reducing parting lines between the door and front fender edges and rear quarter panel edges from 0.16 in. to 0.15 in. It’s a small change, but one that makes a visual difference. As part of the new door design, the RC has black belt-line molding on the doors and quarter panel, changing to stainless steel (silver) from the upward slant of the quarter glass for a sporty look. The exterior mirrors feature integrated LED turn-signal lamps, and aero stabilizing fins are fitted to the tip of the doorframe molding. There is no visible key slot, nor is there a gap between the handle and the cover. (The design allows the key to be inserted behind the handle if necessary.) The door handle is touch-sensitive for locking. It has a built-in LED puddle lamp on its underside, to make the handle clearly visible at night and provide brighter illumination on the ground. A true sports coupe conveys a special feel quite different than that of a sedan. It feels closer to a sports car, but with higher measures of comfort and elegance. The Lexus RC achieves that balance and integrates cutting edge infotainment technology. Large kneepads on the center console, along with door trim that sweeps upward toward the front, sets the emotional tone for the cabin. The center console and door trim feature a layered appearance, expressing Lexus elegance. Contrast stitching is a design highlight. As ambient lighting using LEDs has become prevalent in luxury vehicles, Lexus found a way to give it a more polished effect. In most luxury vehicles, the ambient lighting illuminates downward. The Lexus RC introduces upward facing illumination to create a feeling of welcome like that used along the pathways of homes. Attention to detail and intelligent use of technology is evident in a Lexus-first light guiding bar located in the upper quarter of the door panels. A single LED lamp mounted at the front of the bar shines through a series of microdot granules. Some of these reflect strong light while others reflect less light, so they are graded away from the light source to create continuity of softness. The light is always reflected; at no stage does the LED shine directly into the cabin. Facing a four-dial gauge layout, the RC driver feels immediately connected to the car’s sporting intent. Silver rings trim the speedometer and tachometer, which are flanked by engine temperature and fuel gauges. A 4.2-inch thin film transistor liquid crystal display (TFT LCD) at the center of the instrument cluster presents the full-color Multi Information Display (MID). Linked to the car’s multi-media system, the MID can display vehicle, audio and navigation information. Classic sportiness meets cutting-edge convenience on the Lexus RC’s steering wheel, which integrates switches to control the MID, phone function, audio functions and cruise control (standard or adaptive). The F SPORT adds an array of special features to create an immediate impression, the moment the driver enters the cockpit, that this is a unique sports model. The gauge design is directly descended from the LFA supercar, using full-length illuminated needles and needle rings, and a white outer band with inverted colors. The F SPORT pedals and driver’s footrest are aluminum, the steering wheel and shift-lever knob are trimmed in F SPORT exclusive perforated leather, and the steering wheel has an F SPORT emblem. 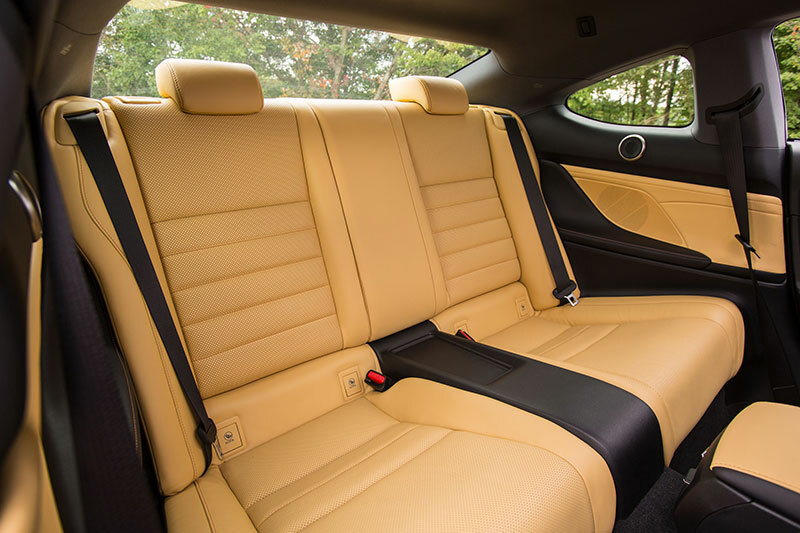 Even at first glance, the Lexus RC’s seats seem special. And they are. They get their premium look and feel from the integrated foaming construction. The upholstery is set into the mold, which is then filled with foam to complete the seat in one process. This contrasts with the conventional method of seat construction where the molded foam pad is covered with upholstery. Using the integrated foaming method, the material does not need to be stretched as tightly over the foam, resulting in a premium feel and high-precision appearance. Filling the seat in a single process also eliminates wrinkles and slippage of the cover. The heated and cooled front seats use a fast-acting carbon heater system. The seat design effectively disperses body pressure the instant the occupant sits down, creating an instant sense of comfort. The design provides optimum comfort during normal driving and added support when the driving turns sporty. F SPORT seats have unique quilting and flowing stitching. Wedge metal trim uses thinly machined sections of metal with a precision surface treatment to add to the three-dimensional expression. Lexus didn’t throw out practicality when it amped up emotion in the RC. The 60/40 split-fold rear seat back can accommodate items up to 59 inches long, such as snowboards. With the rear seats in use, the 10.4 cu. ft. luggage area can accommodate two golf bags. Lexus gave much attention to rear seat access. A new dual manual/electric folding mechanism eases access for passengers and is refined in its convenience. The power operation has a memory function, allowing the seatback to automatically return to a pre-set position. The passenger can override the power seat movement manually if in a hurry, for example if it is raining. The seat can then be returned to a pre-determined position either manually or electrically. 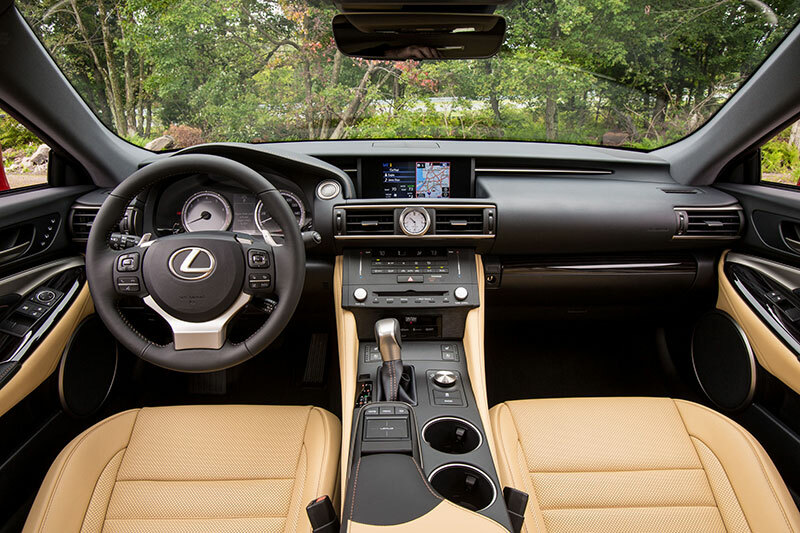 Wood trim is another area where Lexus has set high standards in the luxury category. The RC offers two types of genuine shimamoku wood, which adorns portions of the door panels and dash. Shimamoku denotes an intense, layered production technique refined by Lexus that yields an exceptionally deep-looking, polished finish to the wood. Even in a tech-filled world, the popularity of designer timepieces – especially among car enthusiasts – reveals that there is a place for classic clock design. In the RC, that place is the center of the instrument panel. The RC’s analog clock makes a statement about refined craftsmanship. Taking design inspiration from casual sports watches, a finely crafted elliptical bezel frames a beautifully designed dial with large markers at 12, 3, 6 and 9 o’clock. The attention to detail extends to the way the clock is mounted. The leather finish of the register bezel is designed to resemble a watchband, with thin silver strips above and below it adding a sharp highlight to the area around the clock. Since its inception, Lexus has continually pushed the advancement of mobile audio. Both the standard and optional audio systems play all popular digital formats, whether from CD, iPod®, USB or other device. The standard audio system drives its 10 speakers – including a 10-inch subwoofer — with 256 watts total output. The speakers include 3.5-inch left and right dash speakers, a 2.6-inch center dash speaker, seven-in. front-door speakers and 6.3-inch rear side panel speakers. The subwoofer is mounted beneath the rear panel. Lexus is the only auto brand to offer mobile audio by Mark Levinson, one of the world’s elite home audio brands. Available in the RC, a new Mark Levinson 17-speaker system creates a stunning 360-degree, three-dimensional sonic space. The system produces 835-watts total output while consuming less power than other systems of similar output. The control panel was designed to resemble the simple, clean designs used on Mark Levinson home equipment. With the top audio offering for the RC the available 17-speaker Mark Levinson® Premium Audio System integrates a new audio restoration technology that was introduced in high-end home systems only recently. The technology restores some of the clarity lost during compression for digital formats commonly used today. The new Clari-Fi technology automatically analyzes compression in the signal of digital tracks (CD, iPod, etc.). It recognizes the level of compression and determines how much amplification is needed, and where, to correct it. The result is a much cleaner sound that is closer to the original recording. The 2015 Lexus RC starts with a fresh slate for multimedia control. For navigation equipped vehicles, a new Remote Touchpad uses smartphone-like touch control, including tap, flick and pinch gestures to control audio, navigation or system information displayed on the center screen, without the user having to look down. The interface is intuitive and easy to use. Moving one finger over the Remote Touchpad panel surface moves the cursor, and pressing down or double tapping enters the selection. An integrated feedback function vibrates the surface when the cursor on the electro multi-vision navigation (EMVN) screen moves over a button. So, you can confirm the cursor movement without looking at the display. In addition to its ample operating area, the touch pad has a surface texture specially developed to ensure smooth movement. It never feels sticky or rough. The clean and cool design and flat shape harmonize with the cabin design. Specially designed illumination makes the white designated areas of the electrostatic touchpad surface appear three-dimensional at night. The RC debuts a new version of Blind Spot Monitor with an extended detection area. The system can assist the driver when changing lanes by providing information not only about vehicles in the side mirror blind spot zones, but also by detecting vehicles approaching from the rear in adjacent lanes. The new system in the RC is able to provide information up to 196 feet behind the vehicle. The new system calculates the time an approaching vehicle will take to reach the back of the RC, and begins providing information when this time goes below a threshold value. The timing, or distance, at which the system starts providing information changes according to the relative speed. Rear Cross Traffic Alert (RCTA) assists the driver when backing out of a parking space or driveway. It uses the BSM radar sensors, mounted on the rear corners of the vehicle, to detect the approaching vehicles from both rear sides of the RC. It uses and the same buzzer and indicators as the BSM system to alert the driver. Lexus designed the RC to be a coupe for all seasons, and available all-weather drive isn’t the only factor. A new cabin climate control system includes two-layer control of internal and ambient air and upper/lower level independent air mixing, as well as independent left and right temperature control. The climate control panel uses high-contrast negative liquid-crystal display for clear visibility. Advanced electrostatic switches in the control panel allow for control of cabin temperature. By dividing the intake air ducts between internal air and ambient air, the RC’s climate control system prevents a drop in temperature caused by ambient air intake when the heater is on, thereby increasing heating efficiency and saving energy. Independent upper and lower multi-layer air mixing enhances comfort by providing control that matches conditions. For example, on a colder day with bright sunshine coming through the windshield, you can set the upper air mix for cooling while at the same time have the lower air mix set for warmth. The RC air conditioning system includes the hallmark Lexus feature of a pollen-removal function, as well as a clean-air filter with deodorizer.